Strobe lights are a favorite eye-popping special effect at parties, discos and clubs everywhere. Now the frenetic flashing can go on non-stop, anytime, anyplace, thanks to American DJ’s new Big Shot LED and Snap Shot LED compact cutting-edge LED-powered white strobes. Although they weigh a mere 2 lbs. and 4 lbs. respectively, both of these pint-sized powerhouses deliver big-time strobe excitement, with a brilliant pulsating white light that will mesmerize crowds and ramp up the energy level at any event or nightspot. Powered by advanced LED technology, the Big Shot LED and Snap Shot LED use less energy than conventional halogen strobes and run at a cooler temperature, so they can continue flashing all night without having to shut down for duty cycles. Their solid-state LED lamps are extremely long-lasting, so they require less maintenance than halogen strobes, too. 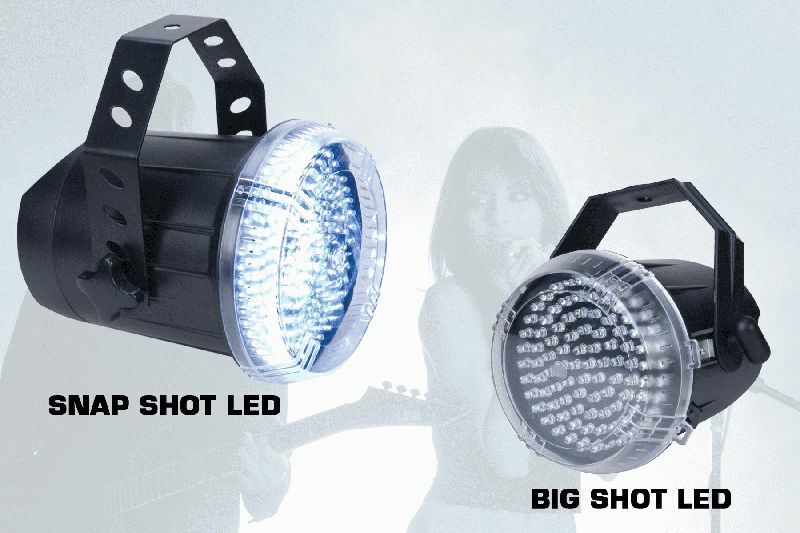 Compact and lightweight enough to be taken anywhere, the Big Shot LED and Snap Shot LED are ideal for DJs, bands, mobile entertainers, discos, bars, clubs and special events. Their very affordable price and easy operation makes them great for putting extra flash into home, dorm and holiday parties, too. “Using LED technology, we’ve taken the classic strobe effect to its next generation,” said Scott Davies, General Manager of the American DJ Group of Companies. “The Big Shot LED and Snap Shot LED represent a big improvement over traditional halogen strobe lights. Their LED lamps last much longer, they use less energy, and they generate virtually no heat -- plus they’re amazingly bright. The smaller of the two units, the Big Shot LED uses 96 bright LEDs as its light source. It weighs only 2 lbs./0.5 kg. and measures a trim 7.5”L x 6.75”W x 5.75”H/190 x 170 x 145mm. Very economically priced, the Big Shot LED’s MSRP is just $49.95. Its larger cousin, the Snap Shot LED, is powered by 220 LEDs, which produce an impressively brilliant output. Featuring In/Out ¼” mono plugs on the rear, it can be linked with other Snap Shot LED strobes for Master-Slave operation. It is also compatible with American DJ’s S-10S and S-4A/DMX strobe controllers (sold separately). The Snap Shot LED weighs 4 lbs./2 kg., and its dimensions are 12.25”L x 10”W x 9”H/310 x 250 x 230 mm. The MSRP of the Snap Shot LED is $99.95. Both units include a Strobe Speed Adjustment Knob on the rear panel, which gives users easy control over strobe rate. Both are housed in an attractive lightweight high-tech case, which makes them look as good on the job as they perform. Despite their impressive output, the Big Shot LED and Snap Shot LED each consume only 15W of electricity maximum, allowing users to save on energy costs and link more units to a single electrical circuit.